The legal fees incurred with regard to a divorce can be substantial. I have written several blog posts in the past cautioning litigants of how their decisions and actions during a divorce matter can dramatically impact the level of legal fees that can be generated, and the ways litigants can reduce or limit those fees. The more legal fees incurred, the less money there is in the marital pot to be divided between the parties, to have available for future needs and expenses (college educations, retirement, etc. ), and/or income to pay support or one’s own living expenses. However, the expression “it takes two to tango” is never more apropo when it comes to legal fees, for as much as one party may try to limit those costs, if the other party persists in maintaining unreasonable or unrealistic positions for whatever their reasons or motives, substantial legal fees will inevitably result, payable by one or both parties or as may be allocated by the Court. After the divorce case has been concluded (and even during the course of same), clients in the past have asked me for a breakdown of the legal fees they have paid in the hope and expectation that they may be able to deduct some or all of them from their income taxes. Indeed, many clients were under the belief that all of their fees would be deductible. I have had to diffuse them of this notion and have advised them that the amount of legal fees which they might be able to deduct is very limited, and namely only those fees associated with addressing the creation or maintaining of taxable income (alimony) or the providing of tax advice relating to same. Being able to allocate the legal fees rendered in a given case to these limited issues was often difficult to task, since most services are intertwined over a multitude of other issues. Motions which may include alimony, often address custody and child support issues as well. So too final determinations whether by way of trial or settlement, of which alimony or tax considerations represent only a fraction of the time devoted to the overall case. We do our best to provide an allocation, estimating which portion of their fees may fall within those services which might be deductible, but always with the caveat that they review them carefully with their accountant or tax professional who would be responsible for making a final determination of which legal fees, if any, may qualify for a deduction. However, beyond the current tax year of 2017, I will not be confronted with having to respond to such client requests. 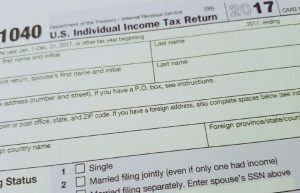 While the family law impact of The Tax Cuts and Jobs Act of 2017 has focused largely on the treatment of alimony for tax purposes, this Act has also reduced or eliminated many forms of itemized deductions, in return for reductions of the tax rates and an increase in the standard deduction. Among the miscellaneous itemized deductions which were repealed where the attorney’s fees related to taxable income (i.e. alimony) and tax advice as regards to one’s personal tax returns. (Tax return preparation and advisory fees related to business income – Schedule C, E, F – continue to be deductible.) Simply stated, for tax year 2018 forward, a party will no longer be able to deduct legal fees incurred in conjunction with a divorce action. While the potential tax deductibility of legal fees was rarely a consideration for most people until a matter was concluded, it would be wise to advise one’s client at the outset of the elimination of this deduction so that they are not surprised when they are told this by you or their accountant when preparing their tax returns in the future.